This adorable young lady arrived on June 1st, 2018 at 9:35pm! 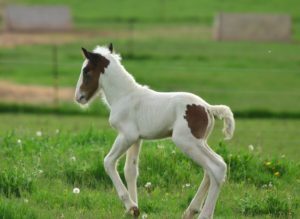 She was imprinted and is being worked with using natural horsemanship methods just like we do with all of the foals that are born at White Bison Farm! We named her Limerick and she is a complete sweetheart! After her first evening alone with her mom I came back out in the morning and she was already whinnying to me! 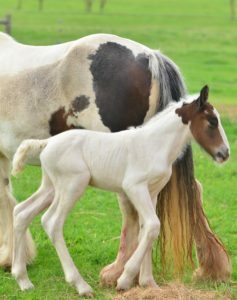 Imprint training is key to having foals have a great start in life! 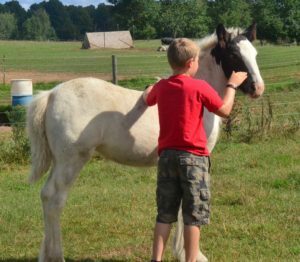 Natural horsemanship training is the key to creating horses that are not only respectful, but also have a great understanding of all of the basic ground work exercises. We do a lot of work with desensitzing also and this little lady understood that plastic bags, towels, and noisy bottles weren’t scary in the first couple of hourse of her life! We expect Limerick to mature to about 14.1hh and she is negative for PSSM1. Limerick has some great bloodlines and will be registered with the GVHS. She can be double registered with the GHA also! Limerick is a tri-colored Gypsy with brown, white, and black markings! 2019 Foals Due this Spring! We have three foals due this spring! All of the foals are sired by our gorgeous stallion, WHR Silky Boy Jr. (aka Tareck). The mares who are bred to Tareck are The Irish Black Faced Mare (Irish’s baby is under contract at this time), My Sweet Teagan, and Ailish of the High Kings. The foals from Teagan and Ailish are all for sale in-utero for $8000 each. If you would like any additional information on our upcoming foals or would like to do a contract for one of the foals in-utero we will be happy to discuss that with you.